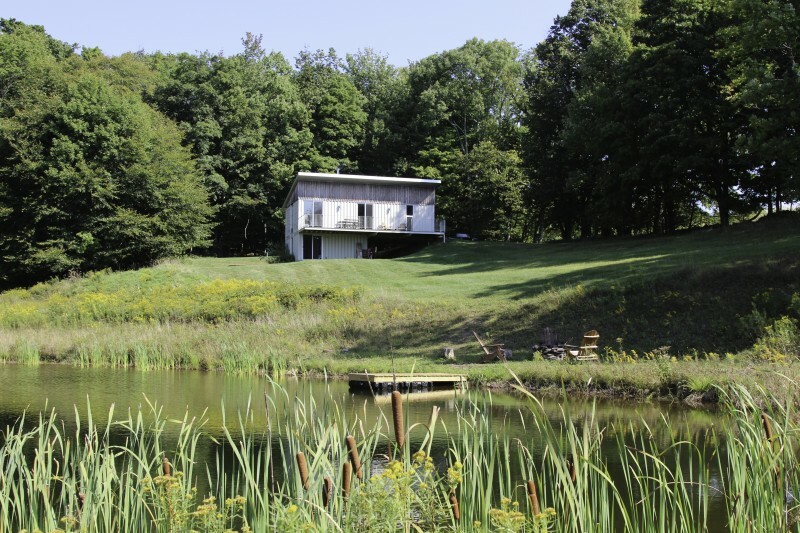 This cool country pad, fabricated from shipping containers and tastefully decorated, is perched with perfection near the top of a hillside clearing, overlooking the pond, and out to a most extraordinary view of farmland and hills folding into one another out into the distant sky. The spectacular vista can be appreciated from the master bedroom, the main living area, and the guest bedroom. House sleeps 4-6. A long, cantilevered deck, accessible from two sets of sliders, is the go-to spot virtually yearround, because even in the winter, you’ll want to sit in the Adirondack chairs and let the expansive panorama wash over you.